Most people have sat opposite a date with whom they have nothing in common, fiddling with the menu and desperately trying to think of something to say. But if you find yourself on such dates over and over again, then obviously there is something wrong with your choices. The basic problem is that people are misled by what lies on the surface. Later, when they discover what’s beneath, they are often shocked and disappointed. Remember, what initially attracts you may not be enough to sustain a relationship. It may not even be enough to get you through a single meal! People usually notice physical appearance first: a pretty face, a slim body, muscular arms, whatever it may be. Then there is confidence, wealth, and status. Power and responsibility, especially when handled with ease, can also be very attractive. But these are merely surface traits. When you sit down for a meal with someone, or go away on vacation, you will soon discover that depth of character matter more. Indeed, as someone’s unpleasant personality is revealed, their looks and intellect seem to evaporate. This is true even of friendships. Different dates suit different people. So before judging others, be sure you understand yourself. Who would suit you? First, consider whether you are an extrovert or an introvert. The first are not always loud, chatty, party-lovers by the way, any more than the second are always shy, awkward, and lonely. Extroverts are simply outward-focussed. They need people and crave company. And this contact energizes them. Introverts, on the other hand, find socialising exhausting. Their energy flows inwards instead. Of course, this does not mean that introverts and extroverts are always better off with someone similar. Indeed, so long as these differences are acknowledged and there is a level of tolerance, they can even complement one another. Extroverts, for example, may grow to love an introvert’s depth and sensitivity, while an introvert may appreciate the extrovert’s energy and cheerfulness. Be conscious of this difference and work out what is best for you. If you are a shy introvert, you may have sought out other shy, quiet people in the hope that your dates would be easier and less stressful. In fact, this can backfire, with two introverts sat in awkward silence wishing the other would say something! More generally, consider your personality type. There are many elaborate systems of classification out there (the Myers Brigg test being perhaps the most famous), but there is no need to get too involved. Just use your common sense. If you are deep and sensitive, for example, you will quickly tire of someone shallow and obtuse. When people begin dating someone new, they tend to focus on things like career, physical appearance, sense of humor etc. But the most important question is the simplest: do you enjoy their company? It is surprisingly easy to overlook such a thing. Passion, romance, beauty etc. are important, but they mean nothing if you do not actually enjoy sitting on a sofa chatting to this person. Imagine you have been on a couple of dates. When you are driving home or walking the dog, form an image of this person and consider your instant reaction – your gut reaction. Do you feel a warm glow? Do you smile a little? Or does the thought make you feel small and uncomfortable? Maybe you feel agitated and worried. Do you find them interesting, for example? Do they make you laugh? What is their conversation like? Of course, the opposite danger is that you like them so much you become infatuated. If you are infatuated with someone, you will leave a date tormented by the foolish things you said. Infatuated people analyze their conversation, cringing and blushing at every bad joke or tedious comment. Another sign of infatuation is that you leave the date exhausted. Others will check their date’s phone when he goes to the bathroom, or hang around his apartment to see who goes in. In short, infatuated people don’t enjoy themselves. An early sign that you are dating the wrong person is the mask you feel obliged to wear. If you find yourself pretending to be someone you are not, or afraid that the real you isn’t good enough, that is worrying. It suggests discomfort and misunderstanding. People act when they feel inadequate or inferior in some way. Maybe your new date is stunningly attractive, for example, or so intelligent and well-educated that she intimidates you. If you find yourself trying to adjust to their personality, trying to impress them and be what you think they will like, then you are not comfortable. Laughter is another good sign. When there is comfort and understanding, humour follows. You have probably noticed the way happy couples mock one another’s faults. They do so because they are comfortable. They know that the other person has taken a long, hard look at them and likes what they see. Most people are able to skim the surface. They can make jokes, chat about their day, tell their funny anecdotes, and so on. 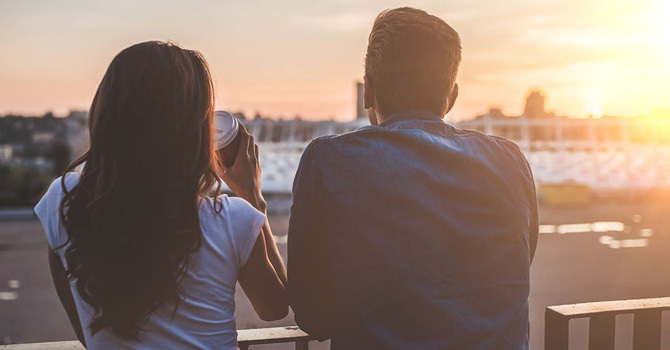 But for a date to turn into a relationship you will need to get beneath the superficial chatter and connect at a raw, intense level. Without that deep bond, no happy, fulfilling relationship is possible. But how do you know whether this will be possible after just a few drinks? First, note how good they are at listening. And that means really listening, not just waiting for you to finish speaking. Some people maintain a respectful silence and then respond in a way that makes it clear they weren’t listening at all. Or maybe they do listen but don’t understand. Many people have a high IQ but low EQ (or emotional intelligence). Don’t assume that just because he has a PhD in Economics he will understand why you are homesick, depressed, or lonely. Does this new date respect your personal space? Many people are so lonely, insecure, and even desperate that they will become clingy almost immediately. Others need constant praise and reassurance. The healthiest relationships are formed between strong, self-contained individuals who know they can survive on their own. Because of this, the relationship is founded on authentic love rather than a fear of being alone. How do they make you feel? Do they recognize you as a separate individual? Or will they try to mould you into something new? Maybe they see you as an extension of themselves. If that is so, they will probably be argumentative, treating even the mildest discussion as a battle they must win. Many will quickly grow possessive, asking you where you’ve been and who you’ve been talking to. Or they will pressure you into spending all your free time with them. Ultimately, of course, no secret exists. All dates, indeed all relationships, are a leap in the dark. The best you can do is look out for certain warning signs, be brutally honest with yourself, trust your gut instinct, and keep trying.